Lois Reed felt fear after learning she had breast cancer. Then the Toledo woman’s thoughts turned to a different kind of fear: How to pay for added medical bills on her fixed income. From left, CareNet Community Health Worker Andrea Vasquez helped Lois Reed with bills while she was battling breast cancer. A former Toledo/Lucas County CareNet client gave Lois the phone number for Andrea Vasquez, a CareNet community health worker. Andrea started working on a comprehensive care coordination plan with Lois, who had a double mastectomy in July 2017, not long after being diagnosed. Using Susan G. Komen Northwest Ohio funding, Andrea helped Lois pay some bills and connected her to needed community resources. For example, Komen funding helped buy a lift chair for Lois to use after surgery, which cost hundreds of dollars even at a discounted rate. Lois is one of more than 115 residents with breast cancer who have received help from a CareNet community health worker to get connected to needed medical and social services. Overall, CareNet has provided mammograms and other services to about 1,700 residents with Komen funding. 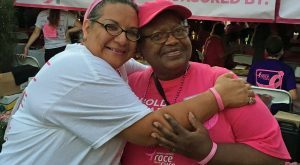 Now that Lois is recovered from surgery and on hormone therapy, she is an advocate for breast cancer awareness and the resources available to low-income residents. A grateful Lois walked in her first Komen Toledo Race for the Cure as a survivor with Andrea in September.